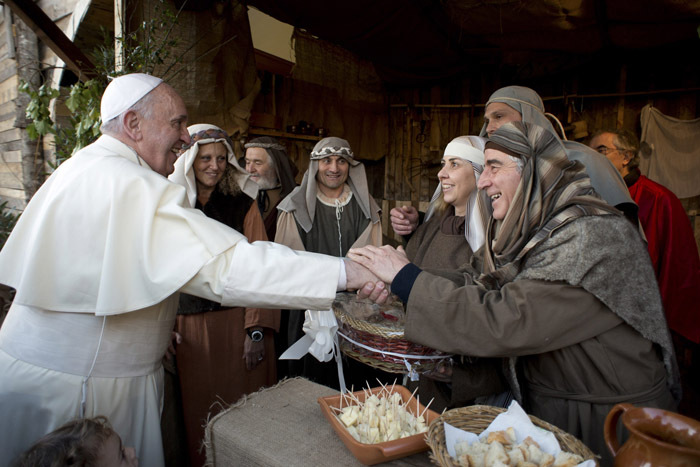 VATICAN CITY (CNS) — Surrounded by cheese sellers, shoemakers and bleating, baying animals, Pope Francis immersed himself in a lively re-enactment of a special day in Bethlehem. 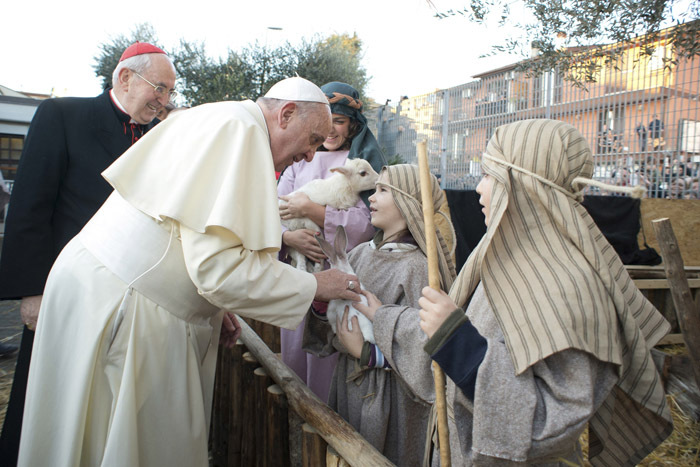 He even let a lamb rest on his shoulders and greeted a tiny baby named Francis, who played the part of Jesus, when he visited a live Nativity scene Jan. 6 at the Church of St. Alfonso Maria dei Liguori on the northern outskirts of Rome. According to Vatican Radio, the pope greeted each of the participants and many of the parishioners who attended. 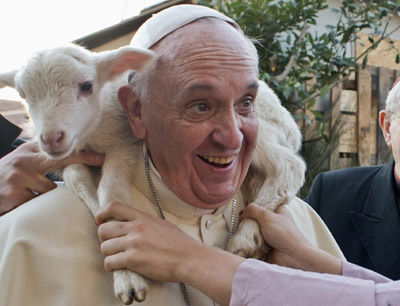 A woman dressed as a shepherd placed a small lamb on the pope’s shoulders. Children sang a Christmas song and gave the pope a bouquet of red roses. At the end of his visit, the pope talked about the importance of a new year beginning with Jesus, who stays by everyone’s side to overcome evil. He asked everyone to pray for children who would be born in 2014 and for all grandparents, who he said are the source of wisdom. The priest who organizes the parish’s live Nativity scene each year said he had invited the pope just a few days earlier and the pope had accepted immediately. “The pope was so happy. He told me ‘Keep it up. Don’t get discouraged,'” Father Dario Criscuoli told journalists.